Our product range includes a wide range of taper lock pulley, timing pulley, v belt pulley, step pulley and industrial taper lock pulley. 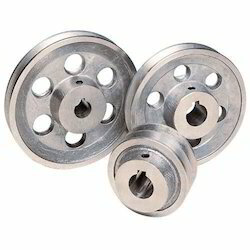 With our vast industrial experience in this field, we are engaged in offering a wide range of Taper Lock Pulley. The pulley that has Taper bush is normally known as Taper lock pulley and can eliminate re boring and keywaying problems. One can change the diameter of shaft and position of pulley by changing Taper lock bush. Moreover, we offer this product from single groove to multiple grooves in various sections like a, b, c, d, e or custom designs. 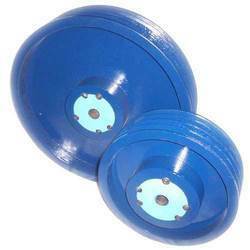 Being pioneers of the industry, we are engaged in offering a wide range of Timing Pulley. The product we offer to the patrons is widely used in various equipments where timing of both the drive is precious and display ratio is important. Our offered product is suitable for eliminating slippage and to maintain Constant Angular velocity. Besides these, the offered product is manufactured at our vendor’s end as per ANSI/BS standard with Carbon Steel/Alloy Steel/Aluminium with Hardened teeth to provide long life. 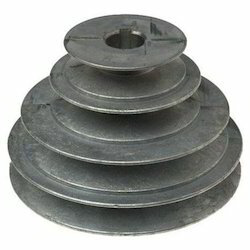 To satisfy the growing needs of customers, we are engaged in offering an extensive range of V Belt Pulley. The product of our company is also known in the market by the name of V-Groove Pulley or Light weight Pulley. The product we offer to the patrons find usage to transmit power for low weight. 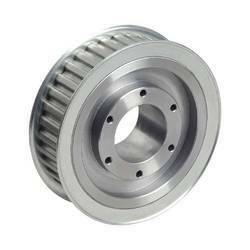 Our offered product is normally used where rotation is less and moving part connected to output shaft is very light. Besides these, the offered product is made from normally cast iron at our vendor’s end. We are counted amongst trusted companies for offering a wide range of Industrial Taper Lock Pulley. 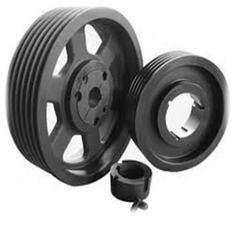 This product is the changeable part in Taper Lock Pulley. In other pulleys, over a period of time shaft damages center part of Pulley and whole pulley needs to be replaced but this pulley can be reused. Moreover, one can reutilizes the taper lock pulley by just simply changing taper bush of the pulley and thus saving the cost of entire pulley.